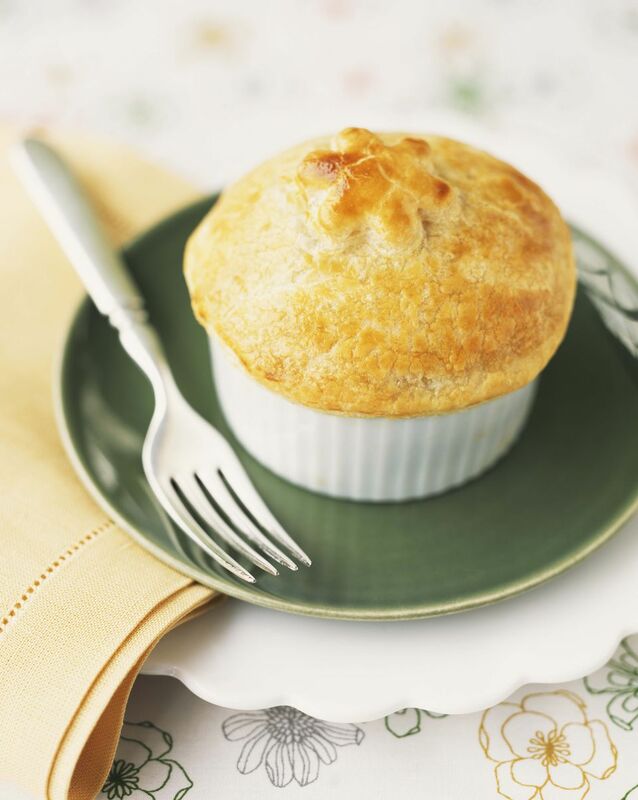 For a vegetarian and vegan pot pie main dish, try this easy homemade vegetarian pot pie recipe filled with vegan gardein "chicken" scallopini, onions, carrots, and green peas and baked into a ramekin with thyme, sage, and other savory seasonings -- all covered with a light and flaky puff pastry. You'll find that this vegetarian pot pie with vegan chicken is just as hearty and filling as any other pot pie yet much lower in fat and completely cholesterol-free. Brown the cut gardein scallopini in a sautee pan with 1 tablespoon of the canola oil. Season with salt and pepper. Remove from the pan, and set aside. To make a roux, melt the vegan margarine in a saute pan, add flour and whisk constantly until light brown in color. Cool, and set aside. In a large soup or stock pot, heat the vegan chicken stock until gently simmering. Keep this simmering and hot for the next step. In a 5.5 quart stock pot, cook onions in canola oil for 3 minutes, and add carrots, sage, thyme, salt, and pepper. Continue to cook for 5 minutes. Add the already simmering vegetable stock, and simmer for 5 minutes. Whisk in nutritional yeast flakes. Add the prepared margarine and flour roux a bit at a time, and continue to cook as the sauce begins to thicken. Stir in the gardein scallopini, tamari and peas. Pour mixture into a large shallow pan to cool. Once the mixture is cool, pour into individual ramekins, a glass pie pan, or a small casserole dish. Cover mixture with puff pastry (be sure to leave a small excess of pastry for folding and fluting of the edge), and seal edges. Cut small slits. Bake for 35 min or until internal temperature reaches 165 F.